Taiji ball qigong is able to condition the physical body and change its structure from weak to strong. In addition, it can also increase the quality of endurance of the body. Due to these reasons, taiji ball qigong can be used to enhance fighting capability, and to increase the chance of survival in ancient fighting situations. According to theory of Muscle/Tendon Changing and Brain/Marrow Washing Qigong (Yi Jin Jing, Xi Sui Jing, 易筋經、洗髓經), the qi enters the bone marrow through the joint areas. Whenever the joints are moving, qi will build to a higher potential of storage. When the body relaxes, the qi accumulated will either be dissipated outward through the skin or enter into the bone marrow to nourish it. Since taiji ball qigong focuses on joint exercises, and through the correct breathing technique, the qi can be led inward to the bone marrow effectively. This is the crucial key of slowing aging. If you are interested in knowing more about Muscle/Tendon Changing and Brain/Marrow Washing Qigong, please refer to the book, Qigong–The Secret of Youth, published by YMAA Publication Center. It is known that the bone is constructed of piezoelectric material. Whenever there is a pressure generated in the bones, there is some electricity (i.e., qi) generated and circulated. This electric circulation is the crucial key of maintaining the bone density and keeping it strong. When you practice taiji ball qigong, due to the constant circular motion or rotation of the heavy ball, the muscles, tendons, and ligaments are constantly stretched and contracted. This generates pressure on the bones and improves the qi’s circulation. In addition, due to the low walking stepping, you also condition the legs’ physical strength. Naturally, this will also increase the bone density and strength. From practicing the special patterns or routines designed in taiji ball qigong, the entire body’s ligaments, muscles, and tendons can be conditioned. At the beginning, a beginner will start with a light ball. When the body has reached a stronger stage, the ball will be exchanged for heavier ones. Through this weight change, the entire body’s strength will gradually improve. The entire body’s framework can be strengthened. Through taiji ball qigong training, the quantity of the qi will be built up and the quality of qi’s circulation and manifestation will be improved. When the qi’s circulation is abundant and smooth, the internal organs will be conditioned. The internal side of taiji ball qigong training includes building up an abundant level of qi in the real lower dan tian (真下丹田) and establishing an efficient way of leading and manifesting the qi. In other words, it emphasizes the quantity of qi and also the quality of qi’s manifestation or circulation. However, in order to understand the theory and the practices of these subjects, you must first understand the most fundamental qi structure or two polarities of a human body. We can then discuss how to produce more qi and how to store it to an abundant level. Finally, we will review the theory and training methods of qi’s manifestation. According to Chinese qigong practice, it has been understood that we have a two-pole system, which constitutes a human central energy line. These two polarities, one yin and one yang, synchronize and harmonize with each other. They are just like the polarities of a magnet that cannot be separated. One of the polarities, the upper dan tian (shang dan tian, 上丹田), is located at the brain while the other, the real lower dan tian (zhen xia dan tian, 真下丹田), is located at the center of gravity (i.e., physical center) area where the human guts (the second brain) are located. The real lower dan tian is the North Pole and it stores qi and supplies it for the functioning of the entire body. The upper dan tian is the South Pole that directs and governs the quality of qi manifestation. These two polarities are connected by the thrusting vessel (chong mai, 衝脈) (i.e., spinal cord), which is constructed of highly conductive tissue. Physically, there are two polarities; however, in function, since these two polarities correspond with each other simultaneously, it is one. 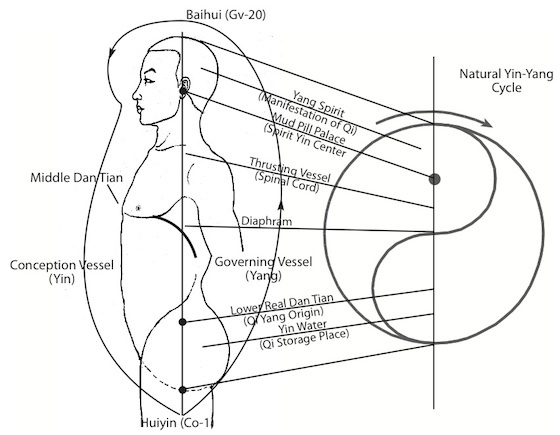 Since the construction of our body is influenced by the natural energy, the construction of our body’s qi system should also be influenced by the yin-yang theory of nature. Therefore, we should be able to compare our body with the taiji yin-yang symbol. If you observe the taiji yin-yang symbol closely, you can see that there is a hidden yang fountain (yang quan, 陽泉) in the center of the yin water while there is a concealed yin spirit (yin shen, 陰神) in the center of the yang spirit. In fact, in qigong Embryonic Breathing training, you train these two polarity centers of hidden yang and concealed yin. For example, if you are able to keep your mind at the center of the hidden yang in the yin water, the qi at the real lower dan tian will continue to be stored and preserved. It is just like a spring of a fountain that is able to produce water continuously. Not only that, but if you also know how to keep the spirit condensed at its center (concealed yin), then the quality of qi manifestation will reach a higher level of efficiency. These two concealed polarities, one at the center of the head (Mud Pill Palace) (ni wan gong, 泥丸宮) and the other at the center of the gut, though they are two, they function as one. If you are able to keep your mind at these two poles, the spirit and the qi will stay in their residences. This process is called “embracing singularity” (bao yi, 抱一). When we practice taiji ball qigong, we should cultivate both our spiritual beings (yin) and train our physical bodies (yang).